NattoMK-7™ was named after a long held traditional Japanese dish called Natto. Natto is made through the fermentation of soybeans and has been a staple of the Japanese diet for centuries35,36. Natto has traditionally been eaten for breakfast with rice and other dishes35. Through centuries of regular Natto consumption, many people started to realize the major health benefits associated, such as decreased blood pressure, reduced incidence of osteoporosis, etc. A group from Kinki Medical School definitively showed how intake of Natto in postmenopausal women caused a reduction in bone loss38. 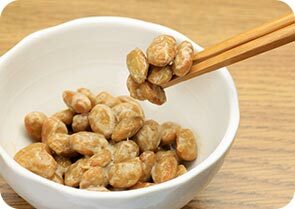 Subsequent clinical and population based studies found that these benefits were largely attributed to the fact that Natto was full of Vitamin K217,37. Even with its greatly indicated health benefits, Natto remains unknown in many parts of the world. Due to its slimy texture and unique smell, many people find it very unappetizing.41,42,43 Fortunately, Vesta Ingredients, Inc. nattoMK7 offers the great health benefits of Natto by extracting Vitamin K2: MK-7 directly from Bacillus subtilis. Thanks to engineering from our top scientists and an advance filtration processes, our Vitamin K2 (MK-7) is of the highest quality. Our product is completely all-natural, allergen free, nonGMO, and even newly Kosher Certified.